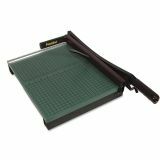 Premier StakCut Paper Trimmer, 30 Sheets, Wood Base, 12 7/8" x 17-1/2"
Permanent 1/2" grid and dual standard and metric rulers. Finger guard and patented automatic locking blade latch. 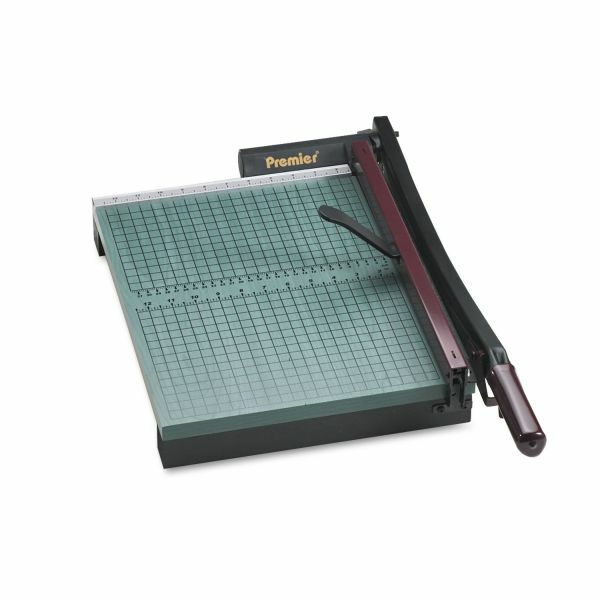 Premier StakCut Paper Trimmer, 30 Sheets, Wood Base, 19" x 24-7/8"
Premier StakCut Paper Trimmer, 30 Sheets, Wood Base, 12 7/8" x 17-1/2" - Paper trimmer features a heavy 3/4" wood base with permanent alignment grid for precise cuts. Self-sharpening fully-hardened steel blades cut up to 30 sheets at once. Hold-down clamp provides a clean cut without shifting or tearing. Safety features include finger guard and patented automatic blade locking system. Torsion spring prevents blade from accidentally falling during operation. Design has nonskid rubber feet. Trimmer accurately cuts paper, matte board, cardboard, film, tissue and textiles. Torsion spring prevents blade from falling. Heavy 3/4" thick wood base with non-skid rubber feet.